Ganni Catania... great passion for football and Naxxar Lions. Ganni Catania, who passed away on March 26 last year at the age of 78, was one of the pioneers of football in Naxxar. He was born in Naxxar on August 29, 1926, the second son in a family of nine siblings. The twenties were exciting years for football in Malta. The game was expanding after its inception in the Cottonera and other areas around the Grand Harbour. By the mid-twenties, however, the game had already reached such remote areas as Naxxar and Mellieha. Wherever you went in those days, you were met by hordes of youngsters chasing a ball in the streets or in the open spaces which, at the time, still separated towns and villages from each other. Like most of his generation, Ganni's education was cut short by the Second World War and the necessity to help his father to provide for a large family. From the start, football was his one and only passion. 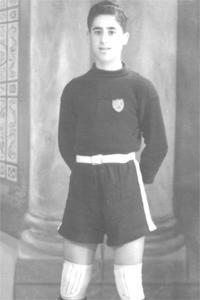 Ganni was one of the founder members of Naxxar Lions FC and also the club's first goalkeeper. Before the war, football facilities in Naxxar were non-existent but the enthusiasm of the youngsters of the village knew no bounds. As soon as the danger of air raids abated, eager hands cleared an abandoned field of stones and other rubble and before long, it was transformed into a football field. This primitive football ground was situated somewhere close to where nowadays lies the Naxxar Oratory. The local lads were helped in no small way to achieve their aim by the British troops billeted at Palazzo Parisio. The servicemen also provided the occasional opposition for friendly matches. A curious anecdote regarding this ground is the way the goal-nets were acquired. It seems that someone 'borrowed' them from the Pembroke grounds. These did not last long however, because shortly afterwards, an angry farmer who had a field nearby, removed the nets as a way of stopping the boys from invading his field in search of lost balls. After the war, Naxxar Lions joined the MFA and were admitted to the Third Division. The Lions won the Third Division Championship in 1944-45. Ganni guarded the Lions' posts the next season in the titanic battle against Hamrun Liberty in the Second Division. He helped the team win the championship and promotion to the top division of Maltese football for the first time in its history. That season, Ganni played a blinder in the 3-1 victory against St George's in the FA Trophy quarter-finals and even saved a penalty. The next season, the Lions led by the great Friggieri brothers, Pawlu and Censu, were the revelation team of the top division. The Reds impressed greatly among the elite of Maltese football. Ganni was one of the king-pins in that fine Naxxar edition which gave so much pleasure to their supporters. Naxxar enjoyed three eventful seasons in the top flight. Then, the club returned to playing football in the Schreiber Sports Ground. Those three glorious seasons in the top echelon however, were never forgotten and old-timers from Naxxar still talk about those good old days. Ganni's career was part and parcel of that wonderful period in Naxxar's football history. In 1948, however, he was transferred to Rabat FC but pressure of work and his impending marriage left him with very little time for football. This forced him to abandon what could have been a very successful career. Ganni never deserted his favourite club and continued to follow Naxxar's fortunes from the sidelines. Ganni had two sons who, in different circumstances, could have carried on where their late father left. Dr Ray Catania and Dr James Catania played for Naxxar in the seventies but the pressures of a medical career prevented them from seeking a career in football. Dr Ray Catania told me with a smile on his face how he and his identical twin brother used to baffle the opposition when they played for Naxxar in the Third Division in the 1970s. He also recalls the twins' debut in 1972 when they each scored a goal against Rabat.